Hi guys, my name is Tudor and I am one of the Chief Editors of LAB501. Some of you, who are passionate about overclocking, might know me under the nickname Monstru. We are a Romanian hardware website, which tries to provide accurate information based on thorough testing and investigation, to our native tongue readers. However, one of our reviews recently got the attention of international readers, and after seeing a lot of questions, complaints about the charts we use and a few misunderstandings here and there, we decided to answer some of these questions in our own way, by making a full English review, with new graphs (yes… you won… we changed those graphs you hated so much), and a better page management, so it is easy to read and understand. However, before we dive into the technical stuff, I feel that we have to clear some air, because it is obvious that our situation is not known by many, so some people may make some false assumptions. First of all, we didn’t break any NDA. Even more, we never actually broke any NDA. As long as we get our samples from the manufacturers we work with, we don’t even need to sign a piece of paper – a gentlemen agreement is enough for us. However, in those occasions when we do not get a sample from the manufacturer, but we do lawfully acquire the new products by our own channels, we may sometimes publish a review that fits our own schedule. For instance, we had a similar situation 5 years ago with Bulldozer, and now we have this situation with Coffee Lake, since Intel closed their local offices and Romania is not part of their media communication loop anymore. That being said, I want to apologies to our media colleagues for this situation – we know exactly how it feels. It was never our intention to take the spotlight away from anyone, nor was our intention to do it “for the clicks”. If traffic or fame was the thing that we were after, this would have been the original story, not the Romanian version. No, we just wanted to share the information with our readers, since next week we will be away from the country, being involved in an international modding competition. That is all, there is no fowl play or petty intention behind this review. 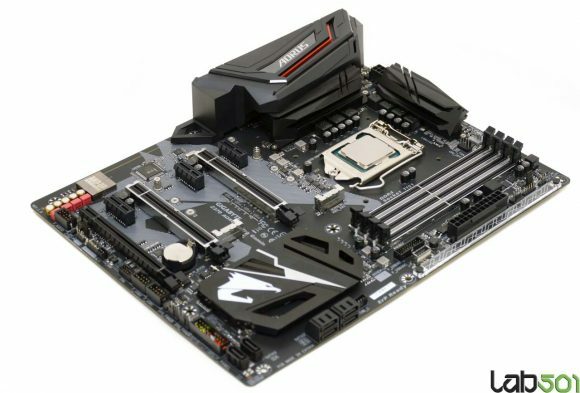 With that in mind, I want to urge you, their readers, to properly give your attention to the results of the hard work editors from all over the world are putting as we speak in their Coffee Lake launch reviews. Our review only reflects our testing conditions and our approach. However, a CPU can be tested in so many ways that you cannot get the whole picture from reading one review. So please, whenever their NDA expires, keep your eyes on your favorite website and read their stories. That is the only way in which you will be fully informed, and their hard work rewarded. Now, before we move on, we need to share a few words about us, since some readers may have never heard of LAB501 and may doubt our technical competence. So there it goes – we are a team of hard-core enthusiasts who have been playing with hardware for more than 20 years, and more than a decade ago we decided to start our own website. We cover any major launch that happens in the world and we work closely with most manufacturers. We also won some international overclocking competitions in the past (GOOC 2010 World Finals, MOA 2011 Istanbul, MOA 2010 World Finals). so we are pretty close to this subject. Also, very often we visit factories in China, Taiwan or Hong Kong, and we keep a very close connection with most system integrators and OEM manufacturer. Wow … how nice ! Another day , another tale ! The review in english is nicer because the new graphs used . Thank you for the built effort ! Very fine review, showing all main aspects of Intel’s last launch. thank you very much, would it be possible to run some 4k benchmarks in future reviews ? As more and more people will adopt 4K we will begin using it in our tests. Why are the temperatures so high on the 8600K? Even though it works with less threads it’s hotter than an 8700K? It doesn’t make any sense. Can someone explain this?? Cesar – the temperatures are lower on 8600K. You are probably looking at the overclocked temperatures (5.1GHz with 1.35v). Very nice OC at 1.35v. This is the trend, for Intel. thank you! too excited now for that 8700k. wonder how it will do with just a cheap aio considering these went to 5.2/5.3 on air. it’s a brand new day! I don’t get it, i checked a few tech websites and numbers are all over the place. I want a CPU for content creation, power consumption and render times are important as it will run for hours a day. Now, if i look at your charts it seems ryzen 1800x is a bit slower or the same as 8700k but consumes 43W more and gets hotter. If i read tomshardware review it seems 1800x, even when overclocked consumes less power than stock 8700k. Checked other websites like guru3d,pcworld and the usual tests in handbrake or cinebench put 1700x and 1800x faster than 8700k and some the other way around. What is wrong here ? What are the real numbers ? Also, what’s the cpu usage in those benchmarks like handbrake or photoshop for different cpu’s ? when it comes to real apps, my advice is to always look at something that is similar to what you will use the CPU for. Because Photoshop is one thing, and 3DSMax is a totally different thing, handbrake is one thing and Premiere is another and so on. So basically, try to find the websites with the test that uses the same tech (encoding engine, rendering engine) as what you will use the CPU for. There are no absolutes here. Second, I cannot speak for other websites, I can only speak for our methodology, where the vCore is fixed, RAM runs at the same clocks with same vDDR and so on. And in our tests, 1800X draws more power generally speaking . We test in Prime, and we test using the last version, that also really supports the new AMD architecture. As I said, I can only speak for my self, and with our conditions, our settings and our benchmarks these are the results.